Northern Grease follows three snowboarders on a 18,000 km road trip across Alberta and British Columbia in a waste veggie oil powered school bus. SAVE THIS DATE: SATURDAY SEPTEMBER 6th. Come on out and support ELF in the on-going fight to save our Sunshine Coast’s remaining old growth forests. Film: Northern Grease (road trip that visits many of the big energy projects in northern BC). The film premiered at the 2014 Vancouver International Mountain Film Festival. Starts @ 7:30pm. Tickets $20 at the door or in advance at MELOmania. New liquor laws allows under 19 guests. 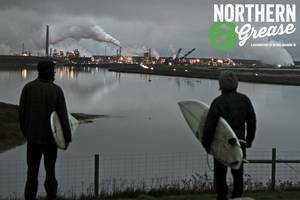 Northern Grease is a must see for teenagers, as it’s produced by 3 guys in their early 20’s, and shows the challenges facing the environment due to heavy industrial energy projects, yet they have fun in the process by snowboarding and surfing the spots that are affected. Several of the soundtracks in the film are from Carmanah’s latest album. They group just completed a 20 city tour of their new CD. The Sunshine Coast is fortunate to have them on this bill.